A polar vortex is gripping the northern half of the U.S., creating brutal conditions. It’s minus 10 this morning in Paradise Hill, Saskatchewan where I hunt a lot, and around zero and dropping in Minnesota and Wisconsin. How do northern whitetails survive this intense cold and snow? …deer physically prepare for the winter by better insulating their bodies. In the fall, deer gradually trade their summer hair coat for a winter one, which consists of thicker, longer, and darker hairs called guard hairs, while also growing in a much thicker undercoat. They are generally less active, sometimes dropping their metabolism by half, which allows them to save energy and eat less. Deer may physically hunker down during particularly harsh weather—not moving for days, even to eat— which is made possible by relying on their fat stores. 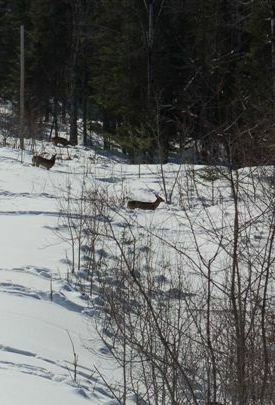 Finally, in brutal conditions, deer gravitate to stands of thick spruce, pine and other conifer trees, which provide thermal cover from wind and snow. They may hunker down in there for days, rising only to nibble twigs, stems, grasses, and other plants that might be available. That deer can survive the brutal winter of a place like Saskatchewan, and grow huge racks the following summer, amazes me. This entry was posted in Big Bucks, BigDeer, Deer Hunting, whitetail deer by admin. Bookmark the permalink. Well I have a good layer of fat so I guess I can make it until April…oh wait I was fat last July too! Copy that on the fat layer, BD! This means I should be just fine tomorrow and Thursday too. I will only leave the couch/T.V. in order to ….”nibble on snacks, meat, cheese, chips, and other assorted high-calorie foodstuffs”….as I prepare to stave off this brutal cold.